We know that Everything DiSC Work of Leaders is being added to several leadership development programs that already exist. But one of the great things about Everything DiSC products is that they don’t have to be used only by professional trainers. 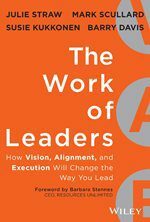 In addition to the Work of Leaders Facilitation Kit with its videos, slides, handouts and leader’s guide, here are a few ideas for additional training activities and readings that follow The Work of Leaders book. What would your followers say? This is adapted from Phillip Van Hooser’s book, Leaders Ought to Know. 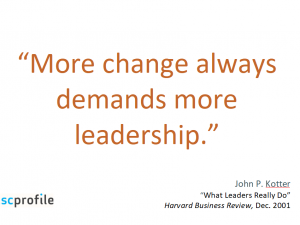 Ask participants to think about the best leader they’ve ever known. Once they are all envisioning him or her, ask them to choose one work that best describes what made this leader so effective and write it down. Then ask them to share. Record these descriptions on a flip chart or other tool. Ask participants to do the same for the worst leader the participants have ever known. Record the descriptions. If members of your group are having a hard time seeing themselves as leaders or if they are new to leadership roles, ask them to choose two words from the positive list and share with groups of just three or four how they display those leadership traits. As a journal assignment, ask participants to write about at least two other positive traits they know they can exhibit. Ask them to also write about any fears they have about showing traits on the negative list. The hat tip for this goes to Patrick Lencioni and his five questions from The Advantage. Let participants know that they can discuss these questions in light of their organization, their department, or their team. Remind them that the first step in creating a vision is exploration. So they don’t need to have firm, definitive answers to these questions yet. But encourage them to try answering the questions for a few minutes. Divide into small groups if necessary. Stop the group(s) and ask them to reflect out loud on what made answering these questions difficult for them. Ask these questions if they are having difficulties responding. These questions can also be used as part of a journaling exercise. 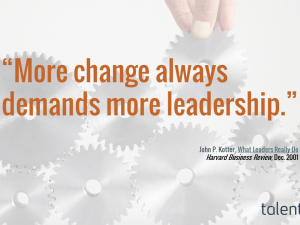 How could you as a leader make this exercise easier for your followers? How do you incorporate your personal values, your own goals, and your personality into your answers? Are there conflicts or uncertainties in your tentative answers? How can you gather more data to better answer these questions? How can they illustrate their vision through stories, images or words that evoke an image? Even though each of us has probably been a leader multiple times in our lives, being a great leader takes practice. Can we practice being bold? As either a journal or group exercise, ask participants to share a story about a time when they took bold action. When did they stretch their boundaries? Where did they find the fortitude, the support, the inspiration, or whatever it was that helped them take a different step? As a journal exercise, ask participants to write about where they need to be bold now or very soon. Ask them to answer these questions: What are the risks you face in not being bold? 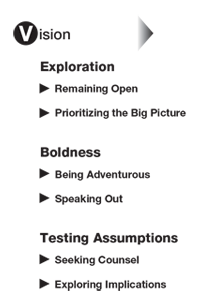 What are the risks of being bold? What are your fears about taking (or not taking) action? Who or what could support you? 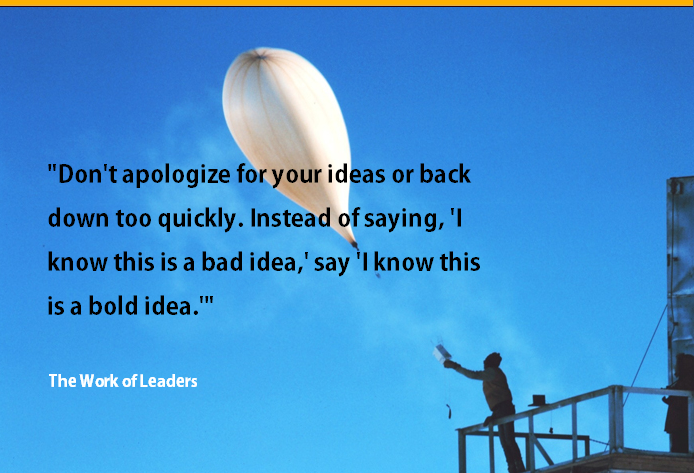 How will you respond to any push back after you take bold action? How to Kickstart Your Company’s Idea Market, Inc. Resourcefulness is encouraged and rewarded. 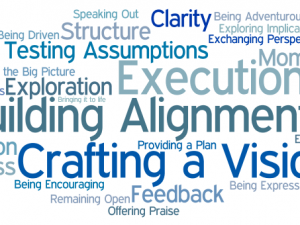 Employees feel able to focus on outcomes instead of getting caught in the activity trap. We have a structure in place for evaluating new ideas. Continuous innovation is an integral part of our organization. Innovations are easy to introduce; there is a pathway for gaining sponsorship and resources for innovation. Ask participants to share an idea with the group. It can be big or small, tactical or strategic, workplace-related or career-related. Ask for feedback. Listen. As an assignment outside of the classroom, ask for additional counsel. 7 Tips for Making Powerful New Connections, Inc.
Gary Klein’s pre-mortem exercise consists of gathering a group of people in your organization and telling them that the project has failed spectacularly. They write down all the possible reasons for the failure. Problems are surfacing while there is still time to make changes. The team is also sensitized to early warning signs of possible problems. A more complete set of instructions can be found at The Pre-Mortem: A Simple Technique To Save Any Project From Failure. Ask people how their DiSC style was reflected in their comfort level in taking on each of these tasks and assignments. What can each style learn from the other styles? For example, if an S-style person has shown great boldness, how did she do it? Was the process any different from a D-style person who typically shows more ease in taking risks? 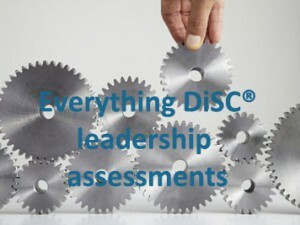 You can purchase Everything DiSC assessments from any Everything DiSC Authorized Partner. Or buy from us at https://www.discprofile.com.